By increasing blood flow to the injury area, heat therapy can help accelerate healing. Finally, heat can effectively warm and loosen stiff muscles before exercise. Physicians recommend moist heat for deeper heat penetration than dry heat alone. SoftHeat moist models include an Aquifiertm time-released moisture technology sponge which holds water for more effective moist heat. 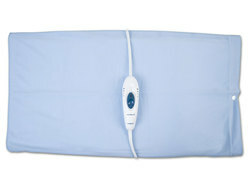 Special Order Item: SoftHeat Heating Pad HP110, 13.5" x 11.25"